Thematic Pack "Macao Grand Prix"
This year the Macao Grand Prix will celebrate its Diamond Jubilee with the 60th running of this celebrated race. Aside from the existing 13 races on the programme held over two weekends in Guia Circuit, there will be ten days of festivities and events across Macao bringing a carnival atmosphere to every corner of Macao. 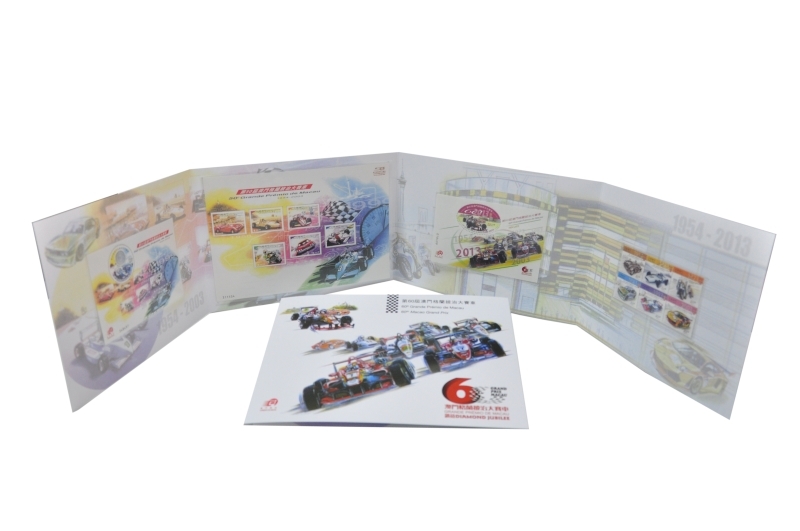 On 8th November, 2013, Macao Post will launch the thematic pack “Macao Grand Prix”, which includes the set of stamps and souvenir sheets of the two issues of “50th Macao Grand Prix” and “60th Macao Grand Prix”. The thematic pack is priced at MOP100.00. It will be available for sale at the Philatelic Shop of Macao Post Headquarters, Rua do Campo Post Office, Maritime Ferry Terminal Post Office, Airport Post Office and the Communications Museum. Get the opportunity to add value to your collection!